Bird-worm seal script (simplified Chinese: 鸟虫篆; traditional Chinese: 鳥蟲篆; pinyin: Niǎo Chóng Zhuàn) is a type of ancient seal script originating in China. The Chinese character 鸟 (鳥 in traditional Chinese; Niǎo in Pinyin) means "bird". The Chinese character 虫 (蟲 in traditional Chinese; Chóng in Pinyin) means any creature that looks like a "worm", including invertebrate worms and reptiles such as snakes and lizards (and even the Chinese dragon). The character 篆 means "seal (script)". Niao-Chong Script (simplified Chinese: 鸟虫书; traditional Chinese: 鳥蟲書; pinyin: Niǎo Chóng Shū). The Chinese character 书 (書 in traditional Chinese; Shū in Pinyin) here means "script". Niao-Chong Characters (simplified Chinese: 鸟虫文; traditional Chinese: 鳥蟲文; pinyin: Niǎo Chóng Wén). The Chinese character 文 (Wén in Pinyin) here means "character". In this style, some parts of characters have a bird-like head and tail added. The bird style sign is a combination of two parts: a complete seal script character and one (sometimes two) bird shape(s). In this style, some or all the strokes are winding, thus producing a worm-like character, but there is no additional bird shape. Seal script evolved from Oracle Bone Script, and diverged into different forms in the Spring and Autumn period, after the power of the Zhou dynasty waned and China began to divide into different states. This kind of seal script first appeared in the middle era of the Spring and Autumn period. It then became popular during the late Spring and Autumn period, and was most popular during the Warring States period. It was often seen in southern kingdoms, such as the Wu Kingdom (roughly today's Jiangsu Province), Yue Kingdom (roughly today's Zhejiang Province), Chu Kingdom (roughly today's Hunan and Hubei provinces), Cai Kingdom, Xu Kingdom, and the Song Kingdom. Each state in China during the Warring States Period had its own variety of script. These kinds of seal script declined after the Qin Dynasty, most likely due to the unification of writing scripts by Qin Shi Huang (unified into the small seal script), after his unification of China, although they were used during the Han Dynasty. 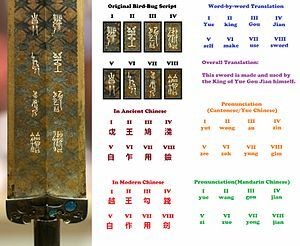 The bird seal script is often seen on bronze and iron antiques of the Yue Kingdom (roughly today's Zhejiang Province). The script was used on bronze and iron weapons, like swords, to indicate ownership or date of completion. The characters engraved on the famous Sword of Goujian provide a fine example. A few examples of the bird seal script can be seen in or on containers and jades of that period. The bird seal script was also used occasionally in the Han Dynasty seals (mainly the jade seals), as well as a few eaves tiles and bricks. The worm seal script is more common in, and probably originated from the Wu Kingdom (now roughly Jiangsu Province) or Chu Kingdom (now roughly Hunan Province and Hubei Province). Examples can be seen on antique bronze weapons, containers, jades, and seals (mainly the bronze seals of Han Dynasty), and constructional or decorative parts like tiles, etc. The characters on the famous Spear of Fuchai would be a good example of this category of seal script. 《鸟虫书通考》 (General Study of Bird-Worm Seal Script), by CAO Jinyan (曹锦炎); ISBN 978-7-80512-849-8. 《鸟虫篆大鉴》 (The Great Collection of Bird-Worm Seal Script), by Xu Gupu (徐谷甫); ISBN 7-80569-368-4; Shanghai Bookstore Press. ^ Qi Huang (2004). Gong Qi; Jerry Norman; Qi Huang; Helen Wang (eds.). Chinese characters then and now. Volume 1 of Ginkgo series (illustrated ed.). Springer. p. 34. ISBN 3-211-22795-4. Retrieved 11 October 2011. ^ The Great Collection of Bird-Worm Seal Script, by Xu Gupu; Shanghai Bookstore Press. This page was last edited on 26 March 2018, at 15:54 (UTC).